Futashikana Shogi (不確かな将棋 futashikana shōgi, literally "uncertain shogi," but meant in the sense of "undecimal shogi") is an expanded version of Shosu Shogi played on an 11x11 board. It is the most recent of my inventions as of January 12, 2019. This game adds four new pieces to the Shosu Shogi army (five if you include the extra Pawn) - the Kirin, Phoenix, Side Soldier, and Vertical Soldier. The Chariot Soldier (promoted Vertical Soldier) moves any number of free squares diagonally or vertically, or up to two squares horizontally. This piece is labeled 車兵 (shahei, meaning chariot soldier in Japanese). The Vertical Soldier moves any number of free squares directly forward or up to two squares horizontally. This piece is labeled 竪兵 (shuhei, meaning vertical soldier in Japanese). The Water Buffalo moves (promoted Side Soldier) any number of free squares diagonally or horizontally, or up to two squares vertically. This piece is labeled 水牛 (suigyū, meaning water buffalo in Japanese). The Side Soldier moves any number of free squares horizontally or up to two squares directly forward. This piece is labeled 横兵 (ōhei, meaning side soldier in Japanese). The Soaring Eagle (promoted Phoenix) moves two squares horizontally and one square vertically, two squares vertically and one square horizontally or any number of free squares horizontally or vertically. It can jump over other pieces, but not when moving horizontally or vertically. This piece is labeled 飛鷲 (hijū, meaning soaring eagle in Japanese). The Phoenix moves one square horizontally or vertically, or two squares diagonally. The Knight is not blocked by other pieces: it jumps to the new location. This piece is labeled 鳳凰 (hōō, meaning phoenix in Japanese). The Horned Falcon (promoted Kirin) moves two squares horizontally and one square vertically, two squares vertically and one square horizontally, or any number of free squares diagonally. It can jump over other pieces, but not when moving diagonally. This piece is labeled 角鷹 (kukuō, meaning horned falcon in Japanese). The Kirin moves one square diagonally, or two squares horizontally or vertically. The Knight is not blocked by other pieces: it jumps to the new location. This piece is labeled 麒麟 (kirin, meaning kirin in Japanese). 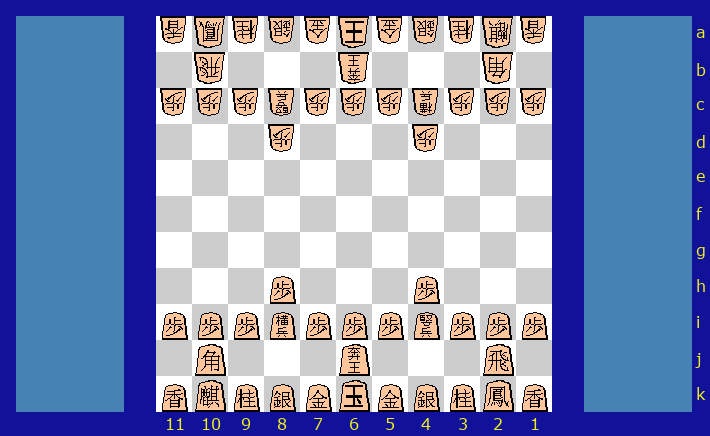 You can Play Futashikana Shogi online with Game Courier.